To reduce the distribution cost in manufacturing supply chains, customers and vendors adopt vendor managed inventory (VMI) policies, where the vendor monitors the inventory levels of customers and decides when and how much to serve each customer (subject to inventory constraints). To implement a VMI policy, the vendor has to solve an inventory routing problem (IRP), where the vendor decides the vehicle routes and schedules simultaneously with the delivery amount and time as shown in Fig. 1 and 2. IRP arises in different industrial sectors, such as petrochemicals, commodity chemicals, and industrial gases. A wide range of constraints, including customer access windows, maximum working and driving time limits, and heterogeneous fleet, make IRP a hard problem. We study mixed-integer programming (MIP) models that accounts for all restrictions of practical IRP (Dong et al., 2014) and also develop solution methods, including preprocessing and decomposition algorithms, to reduce the computational cost. Illustration for inventory routing problem (with drivers). Gantt chart illustrating the solution from one example. – Campbell, A.M.; Savelsbergh, M.W. A decomposition approach for the inventory-routing problem. Transport. Sci. 2004, 38(4), 488-502. – Coelho, L.C. ; Cordeau, J.F. ; Laporte, G. Thirty years of inventory-routing. Transport. Sci. 2014, 48(1), 1-19. – Dong, Y.; Pinto, J.M. ; Sundaramoorthy, A.; Maravelias, C.T. 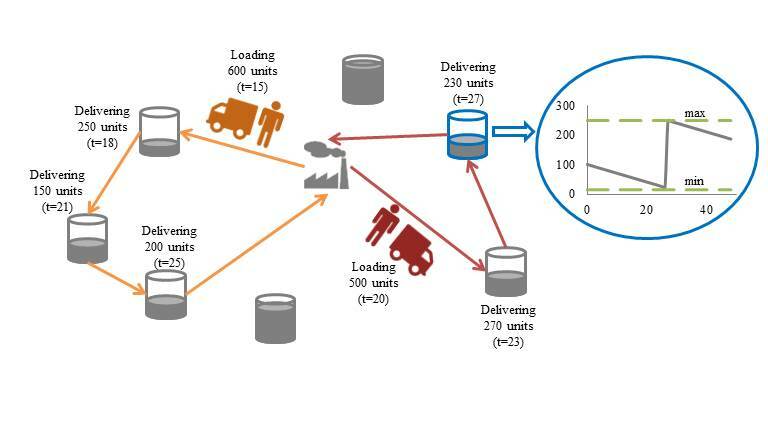 MIP model for inventory routing in industrial gases supply chain. Ind. Eng. Chem. Res. 2014, 53, 17214-17225. – Papageorgiou, D.J. ; Nemhauser, G.L. ; Sokol, J.; Cheon, M.S. ; Keha, A.B. MIRPLib – A library of maritime inventory routing problem instances: Survey, core model, and benchmark results. Eur. J. Oper. Res. 2014, 235, 350-366.